Size: Pint Harness Honey 16 oz. Harness Honey gives new life to stiff, weathered leather. It softens new leather and extends its life. Water repellent, controls mildew and leaves no oily residue. Leather Honey promotes flexibility even in cold weather. It will not rot stitches. In fact, it can be used to lubricated the threads to make stitching easier! Leather Honey is odorless and non-toxic. It contains no solvents, so it won't evaporate... once absorbed into the leather, it stays there!! Leather Honey makes leather water-repellent, controls mildew, and leaves no oily residue. It won't interfere with dye or glue. 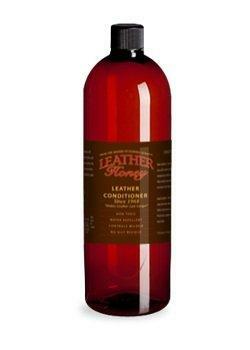 Leather Honey™is the premium leather conditioner. Since it was invented in 1968, Leather Honey has been used to rejuvenate and recondition old leather and soften and protect new leather. Made in the USA and sold by the same family for over 25 years, our non-toxic, water repellent formula penetrates deep into leather's pores and prolongs the life of leather saddles and tack; leather boots, leather gloves, leather baseball mitts, and leather apparel; leather furniture and upholstery; and leather automobile and motorcycle seats and accessories. It softens, protects, and promotes flexibility, leaving your leather feeling and looking beautiful.